Jack in the Box - Jazz it up with this funky slot game where melons and lemons will start point your bankroll in the right direction... but what you really want is 3 Jacks in a row. Because with a maximum bet those guys win you the jackpot! Pop in to Jack in the Box and see what pops up! 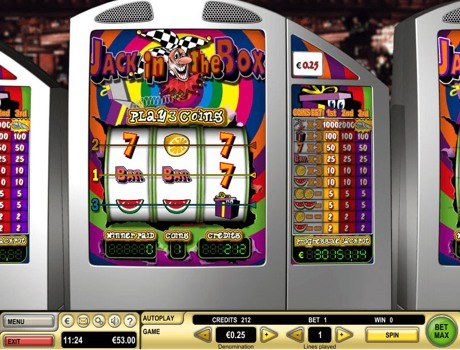 Jack in the Box is a 3-reel, 1-line slot machine, which accepts up to 3 coins per spin. The Jack in the Box symbol can substitute any other symbol to complete a winning combination. The Jack in the Box symbol is also a multiplier symbol. Quick and easy to learn, Jack in the Box gives you lots of excitement and the chance for big cash prizes. To win the jackpot, you must hit 3 Jack symbols on an active payline. You must wager the maximum possible bet in order to be eligible for the biggest progressive jackpot. However, you can choose a lower denomination to win lower jackpots but do remember betting MAX 3 coins each spin.